This ACLS course is an advanced, Instructor-led classroom based course for Medical professionals who respond to cardiovascular emergencies in and out of the Hospital. This course is designed to enhance their treatment abilities through the American Heart Association guidelines. The training will cover high quality CPR through advanced interventions. This course will last approximately 10 hours, all depending on how many people attend class. Cost of the class is $200.00 plus cost of the manual. CPR, Acute Coronary Syndromes, Acute Stroke treatment, Post-Cardiac Arrest care, ACLS Pharmacology, Airway management, transcutaneous pacing, EKG rhythm recognition, Resuscitation Team Dynamics and at the end the students will Perform a Megacode. This course puts a lot of emphasis on high quality CPR and team dynamics. The student should come to class with the knowledge of the ACLS basic pharmacology that is in the ACLS manual, rhythm interpretations and appropriate treatment. For a student to be eligible for the renewal course you must have a current BLS and ACLS card. 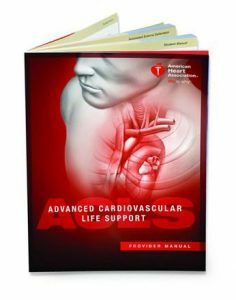 Cost of the class is $150.00 plus the cost of the ACLS manual.